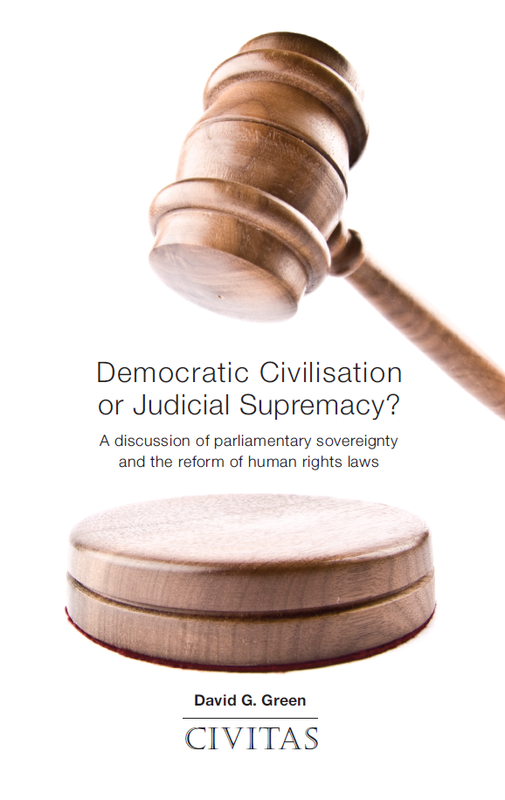 Civitas: Institute for the Study of Civil Society Democratic Civilisation or Judicial Supremacy? Democratic Civilisation or Judicial Supremacy? How should our laws be made and where does final power lie? This question has grown increasingly salient in recent years as the judiciary has pitted itself against Parliament in a series of harmful and absurd rulings. Many of these confrontations have revolved around the Human Rights Act, but far more is at stake. Under our constitution, the legal sovereignty of Parliament ensures that the people themselves are the ultimate political sovereign. When members of the judiciary challenge Parliament, they undermine the ideal of government as a trust for the benefit of all members of society. The readiness of the judiciary to challenge the democratic will of the nation has been harnessed by special interest groups who wish to put their own priorities ahead of those of the wider community. The introduction of no-win, no-fee arrangements has similarly ushered in a period of aggressive litigation by lawyers – driven by the prospect of financial reward – on behalf of the narrow interests of their clients. In this powerful book, Civitas director David G. Green argues that the time has come to challenge a self-serving elite in the legal profession which is encouraging a claims culture based on gaining sectarian advantage. This will mean restoring faith in the UK’s parliamentary system of government which, rather than promoting adversarial conflict between minorities and the rest of society, provides the surest way of reconciling clashes of interest. But it also requires the reinvigoration of a civic culture which does not promote victimhood, but looks to the interests of society as a whole, identifying shared interests and pursuing, above all, the common good. David G. Green is the Director of Civitas. His books include The New Right: The Counter Revolution in Political, Economic and Social Thought, Wheatsheaf, 1987; Reinventing Civil Society, IEA, 1993; Community Without Politics: A Market Approach to Welfare Reform, IEA, 1996; Benefit Dependency: How Welfare Under­mines Independence, IEA, 1999; We’re (Nearly) All Victims Now, Civitas, 2006; Individualists Who Co-operate, Civitas, 2009; Prosperity with Principles: some policies for economic growth, Civitas, 2011; What Have We Done? The surrender of our democracy to the EU, Civitas, 2013; and The Demise of the Free State, Civitas, 2014.